LONDON — Prime Minister Theresa May on Wednesday offered to resign in a final bid to get parliament to back her Brexit deal, as MPs failed in their own attempt to break the deadlock that has plunged Britain into crisis. The offer came just hours before the House of Commons took part in an unprecedented series of votes intended to seek an alternative plan – but which, in the end, only highlighted the divisions among MPs. Not one of eight proposals put forward earned a majority, an outcome that Brexit minister Steve Barclay said "strengthens our view that the deal our government has negotiated is the best option". MPs have twice rejected May’s Brexit deal, both times by large majorities, but she is still trying to convince them - and on Wednesday made what is expected to be her final offer. "I know there is a desire for a new approach - and new leadership – in the second phase of the Brexit negotiations and I won’t stand in the way of that," she told a packed meeting of her Conservative MPs. "But we need to get the deal through and deliver Brexit. I am prepared to leave this job earlier than I intended in order to do what is right for our country and our party." May agreed a deal with the EU last week to delay Brexit amid fears Britain was heading for a potentially catastrophic "no deal" exit on Friday. If her deal is passed by MPs this week, Brexit will happen on May 22 – but if not, she must return to Brussels before April 12 to explain what happens next. 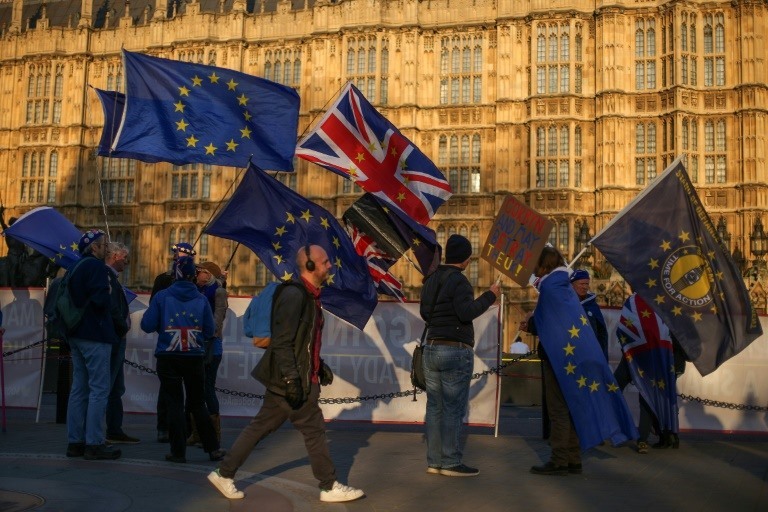 The British parliament is deeply divided over Brexit, reflecting splits in the country that voted 52 per cent to 48 per cent in 2016 to end its four-decade relationship with the EU. MPs have so far only been able to agree that they dislike May’s deal – and that they do not want to leave with no deal at all. Leading Brexit supporter Boris Johnson - a likely contender to replace May - told fellow MPs on Wednesday he would support the deal, while several fellow hardliners have also switched. But a group of Conservatives reported to call themselves "The Spartans" is still holding out - as is the Democratic Unionist Party, the Northern Irish party which props up May’s government. The DUP says the "backstop" plan in the deal to keep open the border with EU member Ireland after Brexit poses an "unacceptable threat" to the United Kingdom’s political union. "We will not be supporting the government if they table a fresh meaningful vote (on the Brexit deal)," a spokesman said. MPs were asked to vote yes or no to eight options - but there was no majority for any of them. A proposal to put May’s deal, if agreed, to a "confirmatory" public vote also came close to passing, defeated by 295 to 268 votes - a result that drew huge cheers in the Commons. Time has now been set aside on Monday for MPs to try and whittle down the most popular options - however, the motions are not binding on May. "There are no easy options here," Barclay said, adding: "I call on all members from across this house, in the national interest, to back the prime minister’s deal." In Thursday’s newspapers, The Guardian called May’s resignation offer "a stitch-up for a bad deal".